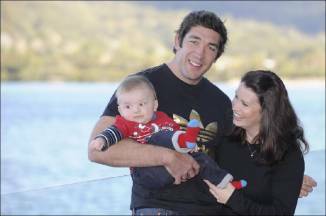 Rugby union player Nathan Hines, and his wife Leann, welcomed twins named Lachlan and Chloe on June 4, a brother and sister for Joshua, aged 4. The twins’ birth was announced on Twitter. Nathan started out in rugby league, playing for the North Sydney Bears in 1997, before switching to rugby union at Manly Rugby Union Football Club the following year. Since then, he has played for rugby union teams in Scotland, Ireland and France, as well as being selected for Scotland’s national team, and the British and Irish Lions. He is currently with French team ASM Clermont Auvergne. Chloe is a very popular name in France, and Joshua is rising in popularity there, but Lachlan’s name seems as if it will stand out in his country of birth. Seriously Australia doesn’t need another Lachlan. I do however like Chloe. Well he’s in France, but I guess they will come back here eventually. You’re right – they have sounds in common, but it’s not something obvious, like Lachlan and Lara or Chloe and Christian. I think that’s why they sound good together.